The Kali backpack, aka the Goddess of Hunting, is one of the very few hunting backpacks designed purposely with women hunters in mind. With 2500 cubic inches and several pockets and compartments, the Kali has the ability to accommodate all your essential hunting gear and accessories for a day in the woods. In addition to the pack’s generous storage space, it also comes with great features such as a heat hardened steel frame, Hypervent™ Suspension Technology, women specific shoulder straps and a hydration system. In this Badlands Kali Day Pack review we shall shed more light on some of the just-mentioned features of the Kali and try to understand why this daypack is widely regarded as one of the most useful hunting packs for women. Also, we shall be looking at some of the pros and cons of owning this product as well as some of customers’ most frequently asked questions. 1.8.1 Q. Who are the manufacturers of the Kali Day Pack? 1.8.2 Q. What are the dimensions of the Kali? 1.8.3 Q. How much does the Kali weigh? 1.8.4 Q. What is the Kali’s total storage capacity? 1.8.5 Q. Does the pack come with a warranty? 1.8.6 Q. Does the Kali have an inbuilt meat shelf for hauling meat? 1.8.7 Q. Can the Kali carry a rifle? 1.8.8 Q. Where are the hydration ports located on the pack? 1.8.9 Q. Can I use the Kali to carry my handgun? 1.8.10 Q. Is the Kali waterproof? 1.8.11 Q. What kind of fabric is the Kali made of? 1.8.12 Q. How many pockets and compartments does the Kali have? 1.8.13 Q. What colors can I purchase the Kali in? 1.8.14 Q. Is the pack hydration compatible? 1.8.15 Q. Can it be used as an overnight backpack? The Kali comes with a heat hardened steel frame whose primary function is to support the carrying of heavy loads. The steel frame helps in properly distributing the weight of the pack so that you feel as though you are carrying lesser load. In addition to this, the frame also helps in balancing and stabilizing heavy loads as you hike. Another very notable feature of the Kali is its excellent Hypervent Suspension System, which is the space that exists between the packand the mesh. What exactly does the Hypervent™ Suspension do? The Badlands Hypervent Technology prevents too much heat from being generated between your back and the backpack by allowing air to circulate between you and the pack. This prevents you from over sweating and allows your back to stay cool. The last thing you need as a hunter is too much heat since it not only makes you uncomfortable but can also significantly reduce your energy level and stamina. But you don’t need to worry about this when wearing the Kali since the Hypervent Technology will keep you dry and cool while you hike. The pack is constructed with the ultra-quiet KXO-32™ fabric which is known for being a very strong, durable and quiet material. The fabric’s ultra-quiet nature is what makes the Kali a very quiet pack. In addition to this, the KXO-32™ is also a waterproof fabric. Being one of the few hunting packs designed specifically for women hunters, the Kali comes with numerous lady friendly features that make it one of the best hunting packs for a woman hunter. Some of these features include a shorter torso, women specific shoulder straps, a waist belt that is angled in such a manner that it fits the natural curvature of a female‘s hips. To make the pack even more comfortable for women, Badlands deliberately positioned the pack’s center of gravity in such a manner that it greatly enhances the balance point of the female wearer. The Kali is a very durable pack. Since it is built for women, it fits women very well. It is hydration system capable. The hypervent suspension that it comes with does a great job of keeping the pack off your back and promoting proper air circulation. It comes with a ton of storage space to store your hunting/hiking essentials. It is a quiet pack. It can carry a bow or a rifle. It is a very comfortable pack. The pack is covered by Badlands’ famous lifetime warranty. The pack would have been better if the manufacturers had padded the internal frame. It is not waterproof and does not come with a rain cover. Q. Who are the manufacturers of the Kali Day Pack? A. The Kali is manufactured by Badlands Packs, a company which is renowned all over the world for manufacturing high quality huntingpacks and accessories. Q. What are the dimensions of the Kali? A. The dimensions are 18″X14″11″. Q. How much does the Kali weigh? A. The total weight of the Kali is 3LB 3OZ. Q. What is the Kali’s total storage capacity? A. The pack’s overall storage capacity is 2500 cubic inches. Q. Does the pack come with a warranty? A. Yes! The Kali comes with Badland’s renowned unconditional lifetime warranty in which Badlands agrees to fix or replace the pack for you whenever it develops a problem. Q. Does the Kali have an inbuilt meat shelf for hauling meat? A. No. The pack doesn’t include an inbuilt meat shelf. Q. Can the Kali carry a rifle? A. Yes. The Kali comes with an inbuilt Rifle Boot that carries a rifle. 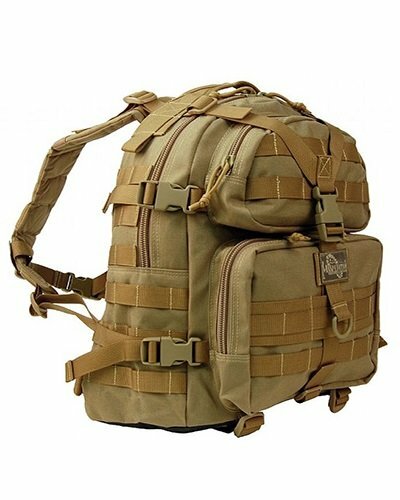 Besides the Rifle Boot, you can also use the multiple straps the pack comes with to conveniently carry your rifle or bow by strapping it to the back of the pack. Q. Where are the hydration ports located on the pack? A. The hydration ports can be found on either side of the pack’s shoulder straps. Q. Can I use the Kali to carry my handgun? A. Yes. The best way to carry a handgun with the Kali is to attach your pistol holster to any of the two nylon webbing straps on the pack’s hip belt. Q. Is the Kali waterproof? A. Despite being made of a waterproof fabric, the Kali isn’t waterproof. The only way you can prevent your gear from getting wet is by using the Badlands Backpack Rain Cover, which is sold separately. Q. What kind of fabric is the Kali made of? A. It is made of the ultra-quiet KXO-32™ fabric, which is known for its toughness, durability and quietness. Another highlight of the KXO-32 fabric is the fact that it is waterproof. Q. How many pockets and compartments does the Kali have? A. It has approximately 6 easy-access pockets and 4 compartments. Q. What colors can I purchase the Kali in? A. 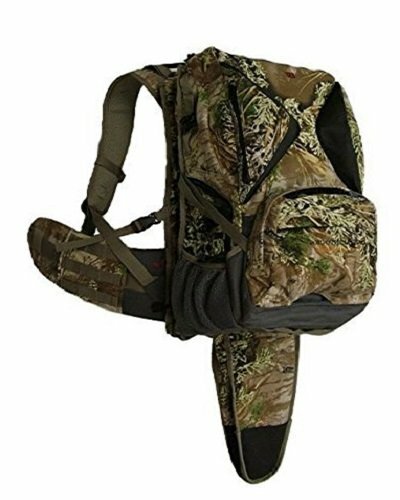 This pack comes in Realtree AP Xtra. Q. Is the pack hydration compatible? Q. Can it be used as an overnight backpack? A. The Kali is first and foremost a daypack. However, it has the capacity to store hunting/hiking essentials for extended hunting trips. If you are a female hunter looking for an excellent hunting pack that will suit all your hunting needs and fit you very well, then the Kali, aka the Goddess of Hunting, is worth considering. In addition to all the great attributes of the Kali, it is also covered by a lifetime warranty.